A career in the healthcare field as a Certified Nursing Assistant or Certified Nurse Aide offers a number of benefits, including stable employment and many job opportunities in Idaho. Working with patients and residents in medical facilities is also personally rewarding because CNAs are instrumental in ensuring the people under their direct care are treated with respect as their basic health, safety and comfort needs are met. As the healthcare industry continues to grow, so will the need for CNAs. The Idaho Department of Health and Welfare regulates the CNA programs in the state. Certified Nursing Assistants are not licensed, so they are officially referred to as Unlicensed Assistive Personnel (UAP). However, the Certified Nursing Assistant must always have active status in the Idaho CNA Registry which is accessed through Prometric. The following steps describe the process for becoming a CNA in Idaho, from selecting a school to getting the nurse aide’s name listed in the CNA State Registry. 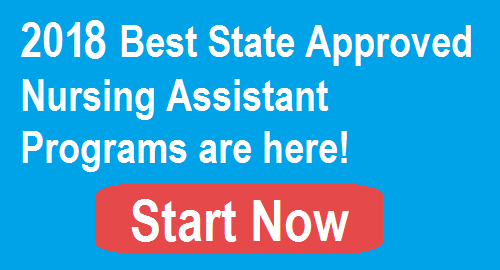 States-approved CNA programs in Idaho are available in all of the state’s largest cities. When researching schools, consider things like location, length of the program and costs. They will vary from program to program, giving students options. For example, Eastern Idaho Technical College in Idaho Falls offers two types of CNA programs. The non-credit CNA program takes approximately eight weeks to complete. The credit CNA program is a semester-long program. The North Idaho College Workforce Training Center offers a CNA program that is 10, 17 or 18 sessions long, depending on the timeframe chosen for attendance. CNA training costs also vary from program to program. The North Idaho College Workforce Training Center mentioned in the preceding section charges $795 for a 10 session course. Idaho State University charges $814 for tuition, textbooks, clinical suppliers and CPR certification. When researching costs, keep in mind the total costs a student will pay include the course fee, textbooks and workbooks, medical supplies, CPR certification fee, uniforms, vaccinations, TB test and examination fee. To compare program costs, be sure to consider the same cost items from school to school. Also, rates often change from year to year. Always inquire if financial aid is available. Educational facilities often have access to different kinds of financial assistance the student may qualify for, like scholarships and workforce training funds. The Omnibus Budget Reconciliation Act (OBRA) of 1987 requires federally funded Skilled Nursing Facilities and Nursing Facilities to reimburse CNAs for program costs if the person is hired within 12 months of earning certification. This makes it free training. There are prerequisites that must be met before taking CNA classes in Idaho. The student will need to apply for entrance into the school first. Upon acceptance, the student can then enroll in the CNA course. Since the CNA program includes classroom and clinical training, and students will be working with patients and residents, the students must provide documentation of immunizations and criminal background. While the specific requirements may be slightly different between schools, the following are usually required. The Idaho Board of Nursing, working with the Idaho Department of Health & Welfare and the Idaho Division of Professional-Technical Education, developed a standard curriculum for CNA programs in the state. The minimum required training hours a CNA program must offer is 120, of which 80 hours must be classroom and laboratory work; 32 hours must be clinical training; and eight (8) hours can be classroom, lab or clinical training. Idaho does not allow assisted living facilities to be used for clinical training. Manual skills are learned and mastered during classroom and clinical training. These skills include activities like performing catheter care, measuring blood glucose, refilling portable oxygen tanks, assisting with a bedpan and many others. Idaho’s examination process for certification is a bit different from other states. There are two parts to the examination including the Manual Skills Evaluation and the Written Examination. However, students must pass the Manual Skills Evaluation first. Only after passing the Manual Skills Evaluation are they allowed to apply to take the Written Examination. The student is permitted three opportunities to pass the manual skills evaluation. He or she must pass it within six months after successfully completing the training program. The university or technical college will administer the Manual Skills Evaluation according to state-approved guidelines. The student is permitted three opportunities to pass the written test within one year after completing the CNA training program. The student is only allowed to test if the person has successfully completed a state-approved training program and passed the Manual Skills Evaluation within the six months of training program completion. If the student does not pass the Manual Skills Evaluation or Written Examination within the allowed timeframe, the person will have to retake the nurse aide training program. Prometric offers a practice written examination on its website. The new Nurse Aide who completes a state-approved training program and passes the Manual Skills and Written tests has met CNA certification requirements in Idaho. The person’s name is entered into the state CNA Registry. If a person completed a state-approved CNA program in another state but did not take the certification examination, he or she can request the Idaho Department of Health and Welfare to allow testing in Idaho. Out of state CNAs who are active on that state’s Nurse Aide Registry can request having their name entered on Idaho’s CNA Registry. It is not necessary to take the CNA exam when applying for reciprocity. A physician or nurse from another country or state can be added to Idaho’s registry with additional training or examination. The person’s license must be in good standing. CNA certification in Idaho is renewed every two years. To maintain active status in the Idaho CNA Registry, the person must perform paid CNA work for at least one day within the prior 24 months of the certification’s expiration date. If certification is allowed to lapse, it is necessary to retake and pass both parts of the certification examination to return to active status. To renew CNA certification, use the “Renew/Recertification Form” link on the Prometric website to access the form. Once certified, the nursing assistant can work in most healthcare facilities. They include hospitals, assisted living facilities, nursing homes, clinics, doctor offices and home health care companies.